It started with Hope. Hope that a bone marrow, stem cell or cord blood transplant could conquer a life-threatening disease. Then came Courage. The Courage to undergo one of the most difficult medical procedures imaginable. Then thankfully, for many, new Life. A Life full of opportunity to enjoy more precious days with family and friends...to see a child thrive, to cuddle a new grandchild, to grow old together with someone you love. This is the promise of transplant. Commemorate this extraordinary journey for yourself, or someone you love, with our solid pewter double-sided Circle of Life charm. It is a special keepsake that can be worn as a necklace, added to a key ring or attached to a backpack or zipper. 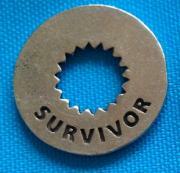 It's a unique gift that survivors will cherish for years to come.